Wallpapering Fog: A legal sticking point for Sponsored Stories? I'm a keen photographer as well as a data monkey and Facebook's development of Sponsored Stories, together with some comments on this Register article recently, have got me thinking. If you take a photograph of a person and want to use it commercially, then you need a model release. It's a form, signed by the person who is in the photograph, that gives you permission to use their image and is an important protection. Without model releases, somebody could snap a picture of you in the street - maybe looking a bit tubby post-Christmas - and use it to advertise their diet plan in the national papers. Happy with that? Thought not. Model releases make sure that you get a say in whether pictures of you can be used commercially. If you decide to try to make a bit of cash from your own back catalogue of photos by adding them to a commercial stock library like iStockPhoto, then you'll find that they're very fussy about photos of recognisable people. You need a signed model release or they won't accept the picture. Here's a Facebook Sponsored Story. It's an advert and it's identified as one. 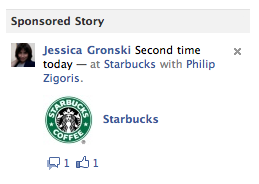 Starbucks have paid to have it appear (more frequently) in news feeds. If you ran exactly the image as above in a newspaper or magazine, then you'd need a signed release from Jessica Gronski allowing you to use her image. You could make the argument that Facebook has so many users, this is impractical, but that argument always sounds to me like "we're breaking the law on such a massive scale that it doesn't count any more". You could argue that by uploading a picture to your profile, that you've given Facebook implicit permission to use it. I don't believe that I have, but what if you're in my profile picture too? Or if my profile picture happens to be a picture of somebody else? Model releases are a real nuisance for photographers, but they're required to abide by the rules and I can't see how Facebook using somebody's profile picture to advertise Starbucks is any different. It will be interesting to see if we get a test case in the near future, of somebody (probably a stroppy photographer) demanding payment from Facebook for commercial use of their image.